Contact us to find you the perfect villa for your holiday from romantic cottages for two, to stately homes and luxury villas for large private functions or overseas weddings. Have a look at some of our unusual places to stay! Give us a call on 01728 748209, use the live chat or send an enquiry. We can arrange flights and hire cars (some villas include a hire car, particularly around the Greek islands), or if you prefer to drive yourself, ferry tickets or train travel to a European villa. Self drive villa holidays to Europe are a great independent holiday option. If you are a fan of TV programme 'The Durrells' or love Gerald Durrell's books then a trip to Corfu is a must! Villa holidays are particularly popular for families and groups of friends, some villas sleeping 16-18 people. If you do want something even bigger, we can source luxury houses, chateaus, haciendas or take over small hotels on exclusive use for family gatherings, weddings, etc. There are villas just for couples as well, so how about a romantic small villa for a honeymoon or even a larger villa (or several villas on the same complex) for a private wedding overseas? Some villas come with housekeeping staff (villas with chefs are available in most destinations) and a welcome pack of essentials to get you started. There are some 'family houses' further afield, such as in Africa or the Indian Ocean islands, which are fully catered for with all meals included, served in your own private house by your personal chef and you are accompanied by private safari guides and hosts during your stay. These 'safari houses' are very popular with families or friends and usually sleep up to eight people and have a private pool too - ask us about African safaris for families using these houses. Mauritius and The Seychelles have many options for villa style accommodation. Lots of large rural villas in Europe are converted farmhouses or even castles, often surrounded by vineyards and fabulous views of the countryside. For family villas a swimming pool is usually a must and some are located close to beaches too. Ask us to check if you need a heated pool. Often bikes can be hired and some villas are part of larger resorts with kids clubs, shops, restaurants and entertainment on site or very nearby. Several families travelling together can be accommodated in a wide range of villas that sleep between 8 and 16 people and often have poolside lounge areas, barbecues, TV rooms, wi-fi, jacuzzi and large gardens. Extras can often be requested such as high chairs, buggies, stair gates, cots, extra beds or even Playstation rentals to keep children occupied! The Caribbean is a great option for family holiday homes and villas, you can even rent a whole island if you have a particularly large group of friends, such as Fowl Cay in the Bahamas. There are some stunning villas on Jamaica (not widely known about so ask us for a quote!) we can offer you four luxury villas in their own grounds with gorgeous views and facilities, live like a movie star, houses can accommodate between 6 and 20 guests, depending which of the villas you opt for. Barbados and the British Virgin Islands also have some gorgeous villa options. If you want to be close to a golf course then Portugal, in particular the Algarve region, is a good option. If food and drink is your thing, head for Italy or Spain. Great destinations for villa holidays for families and friends include Mallorca, Menorca and Ibiza, Cyprus or the Greek Islands. If you want a quiet villa or apartment for just two people but need to be in easy distance of bars and tavernas, try the Greek Islands (read Jules' blog post about her cave villa on Santorini!) or a villa or cottage in the country villages of Italy. For couples (and honeymoons), many tropical resort hotels in places like Thailand and the Maldives offer 'villas' which are not self catering but often luxury room types using hotel services. Book early if you are looking for a large villa as they are increasingly in demand and some do offer early booking discounts too. Watch the changeover day as most are weekend to weekend, but some can offer 10 night stays, midweek changeovers or in the low season, long weekends. If you need a large catered villa for the ski season, please book as early as you can as they are always in short supply! Private houses and ski chalets in the Alps and Lapland are stunning, what better way to relax after a day in the snow than in your hot tub on your balcony looking out over the winter wonderland around you! If you like to be independent but still enjoy luxury surroundings on your holidays, a Villa is the perfect choice! Villas (and 'houses') come in all shapes, sizes and styles and are available all around the world but most popular in Europe and The Mediterranean. Your home from home, self contained and equipped often with modern kitchens, towels and bed linen provided, you just kick back and relax in the privacy of your villa. There are often special offers on villas so check the offers pages or give us a call! Ask us to find a villa holiday to suit you whether a large family or group of friends or a romantic hideaway, wherever in the world you want to go! Tailor made cricket tour packages to The Caribbean Jan-March 2019 choice of hotels and test matches. A range of authentic, owner run villas and holiday homes in Turkey. Coastal, rural, pools and catered. Ideal for family holidays. Luxury fully serviced villa in Atlantic France - available for parties, weddings, private functions. Personal Service guaranteed. This private island in The Seychelles is accessed only by helicopter and combines barefoot luxury with a light ecological footprint. 'Conservation without compromise' is the theme here, on the ultimate tropical island getaway. Experience the heart of Spanish heritage and culture in authentic Paradors - medieval castles, grand palaces and manor houses can be found all over Spain in cities, on the coast and in rural scenic locations. Easter Holiday ideas for families around the world. Villa holidays, sailing in the Med, cookery courses, elephant rides, safaris, snorkelling, kayaking, or why not hire a car and do your own tour? Catered Ski Chalets in The Alps. Suggestions for gorgeous catered chalets with information about local facilities and resorts including Alpe d'huez in France. Experience the ultimate in tropical paradise getaways! Fowl Cay Island is a private 50 acre islands in the Exumas, part of The Bahamas. 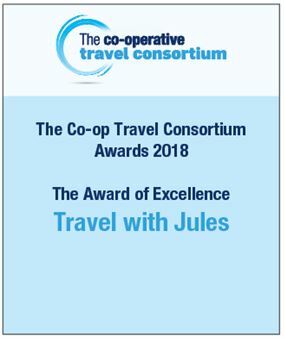 Travel With Jules' customer service is excellent, they were always willing to answer any questions about anything we asked. Thank you for arranging our once in a lifetime family holiday. We had a lovely break and the area around our villa was beautiful. We spent a lot of time at Denia Beach and loved the tiny village of Jesus Pobre and the local food and culture. Thank you for organising another great family holiday for us. Due to an unfortunate incident where our previous holiday didn’t work out, we needed to work with someone we could trust. Our family has some specific needs to fulfil due to having a disabled daughter and Travel with Jules were sympathetic to those requirements and did everything we requested. Every aspect of the holiday was taken care from accommodation to car hire and even organising special assistance with the airline. Understanding the client brief is key and both Mags and Julie do this very well. The ease of booking is great and nothing appears too much trouble. Quick response rate and friendly service. Menorca was suggested to us by Travel with Jules and they came up trumps! Our James Villa was exceptional, and larger than we even anticipated! The place was secluded and private yet only two mins from facilities and amenities. This was our third villa holiday booking with Travel With Jules and we are never disappointed. We had a fantastic week in the Lake District. The weather was glorious, it only rained on one day with a slight shower as we were climbing Coniston Old Man but apart from that we were dry and even had blue skies (see photo) !! The cottage was also ideal, great location - co-op within 100 yds as well as a selection of pubs and cafes in the village and plenty of walks within a short drive - it was also very well set out and very tastefully decorated. I would highly recommend it and would probably go back. We contacted Julie with some guidelines such as general location and dates and she came back to us with lots of good options. The one we picked was perfect and we had a brilliant time - thank you for all your help and we will be happy to recommend your services. Within days Jules had found the perfect villa, including heated pool, in a beautiful, non-commercialised part of Spain, and had booked everything for us – But better than this no-fuss full service was the expert knowledge Jules was able to bring to our holiday.